“Creativity is to change the adverse situations into positive ones and influence others with your attitude, voice and works. Creativity is the heritage of everyone and one shall start it from childhood,” said P.S. 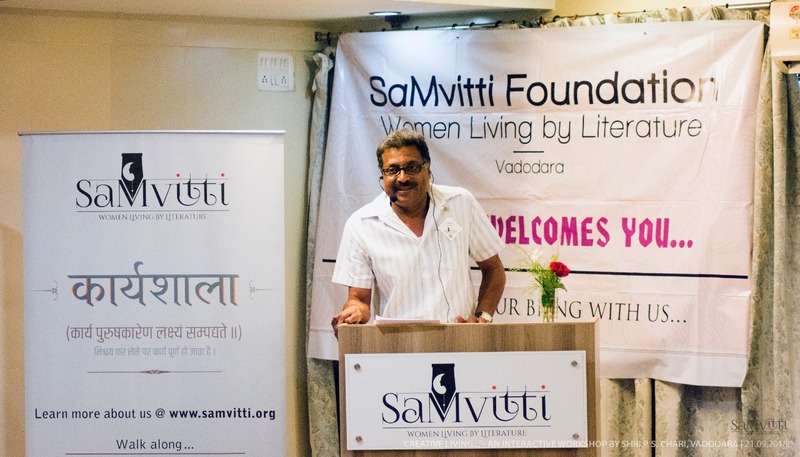 Chari First Trustee and Member, Managing Committee, SaMvitti Foundation and renowned theatre director. Chari conducted a interactive workshop for women in Vadodara on Creative Living. 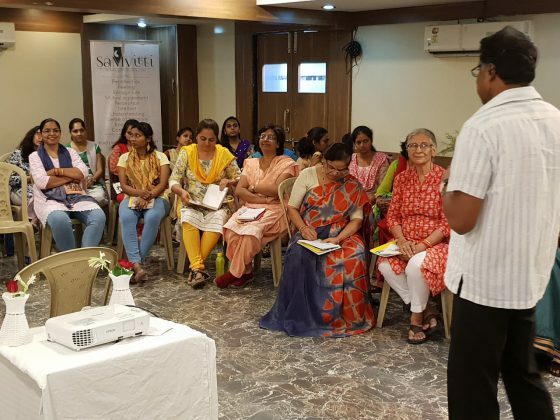 About 50 women from different fields and ages attend the workshop and learned the art of creative thinking to implement it in their life and profession. “The workshop for women participants was organized with an objective to facilitate an understanding of team-building, learning and to generate ideas quickly. 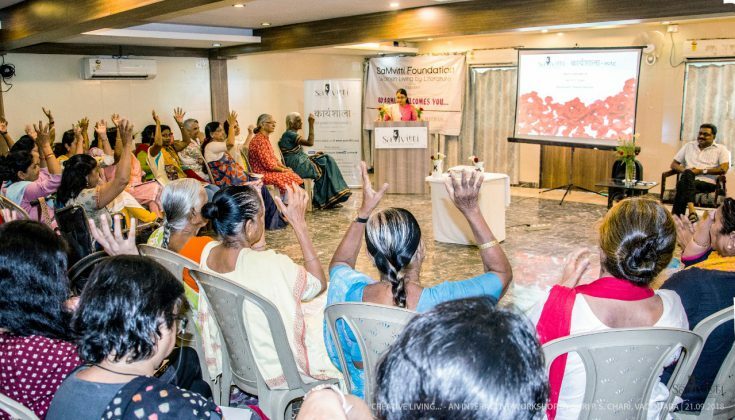 The seminar is valuable for the participants as they learn to channelize their creative potential in achieving progress and happiness in life. It’s a chain reaction as they influence their children, youth and everyone they meet,” said Chari. He also added that their is also a need of creativity in politics and one can see the change after every elections. At the start of the workshop SaMvitti Foundation gifted an autographed book from the personal collection of Rajmata Shubhanginiraje Gaekwad to P. S. Chari followed by other books like ‘Natak Ki Duniya’ ,‘Chowk Chowk Par Gali Gali Mein – Vol. 1 & 2’ by Safdar Hashmi to all the participants. The idea was to draw inspiration from the text. 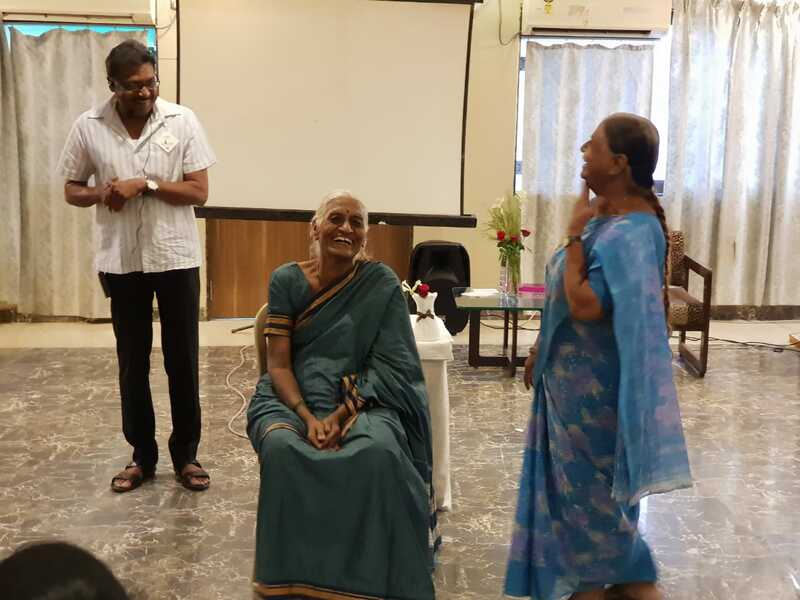 P. S. Chari initiated different interactive exercises like participants to volunteer and then made one of them hold-open the door of the hall for a minute and made the remaining volunteers look out of that door. After a minute when the door was closed, he asked the other volunteers what they had seen through the open door. Each volunteer responded differently with just a few similarities. By this exercise he explained that each person sees the same view differently. In the second of exercises, Chari invited a different group of volunteers and handed each of them an A4 sheet of paper asking them to keep their eyes closed, gave them numerous instructions to first fold the paper in various ways and then tear a small part of the paper from a particular point. At the end each volunteer was asked to open and display their sheet of paper and the outcome though receiving the same instructions was different and unique. By this exercise, he elaborated that while the eyes are closed, one can go deeper within and stay focused. He suggested that this is the way one should deal with children and asked the participants to not let the ‘child’ within them die as he believes that children have very high creativity which can be developed further by providing proper stimulation. He believes that every person is creative in their own way. In the third a different group of volunteers were invited and distributed into two separate teams. 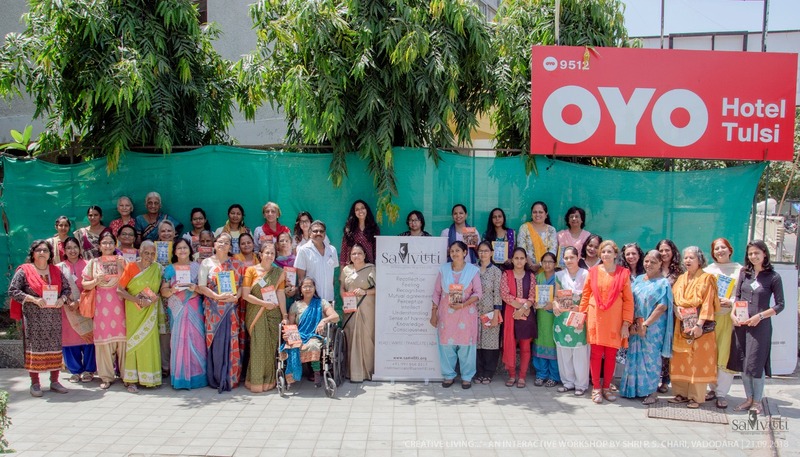 They were then asked firstly to discuss within themselves for a minute and then collectively prepare a creative display of their ‘duppatas’ in the best possible way. In the fourth of exercises, he called-up a different group of volunteers, again made two teams out of them and asked each team to firstly discuss within themselves for a minute and then collectively prepare the best creative arrangement of 3 given chairs. He then asked other participants to come and use that arrangement as-it-is in the most unique way as possible. By both the (3rd and 4th exercises),Chari explained how one’s idea can be built further into another idea. In the fifth he asked each participant to think of a popular song and then remember its tune. Then he asked the participants to first replace the language of the words (other than the original) keeping the same tune and then sing the song with replaced words and asked the other participants to try and identify the original song. In the sixth of exercises he made each participant close their eyes and asked them to take a few minutes to draw on a sheet of paper anything that they felt like. Then, he took a few ‘daringly different’ drawings, showed them around to other participants and asked them (except the one who had drawn it) to say what the drawing depicted. Each could see the drawing differently. 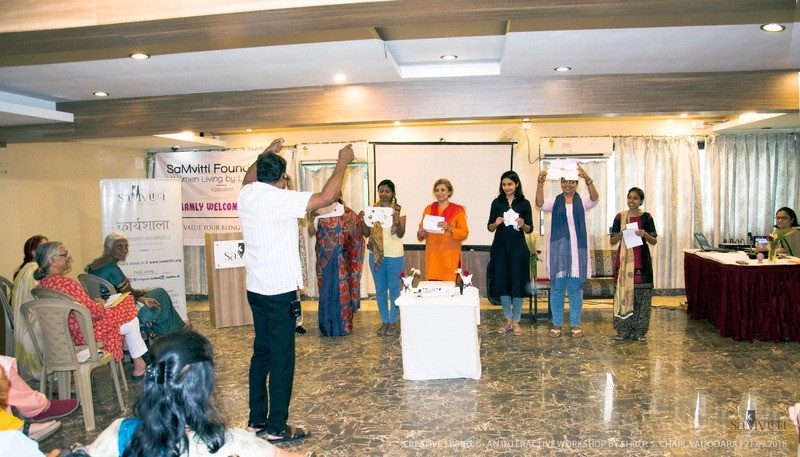 In the seventh of exercises he asked the participants to think of the names of objects starting with the first letters of their name and surname. He then asked them to pick the name of the object for each and then join the names to come-up with a third unique name. For example if a participant’s first letters of the name and surname are P and Y respectively, and if the names of the objects chosen were ‘Palace’ and ‘Yoghurt’, so the third name comes-up as ‘Palace Yoghurt’. By all the 5th, 6th and 7th exercises Chari explained about thinking creatively and the expression is also important. He gave various examples suggesting the connection of creativity with women. He explained that many folk songs which were sung by males were popular because women used to sing it for long. He brought to light how traditional forms of creativity had begun by giving an example of how women found different ways to reuse old items. He added that the outcome of creativity is higher when we use all our senses and also explained about the humour as important for creativity by using a situation where he asked one participant to sit on a chair and asked the rest of the participants to find a way to convince her to stand-up from the chair. 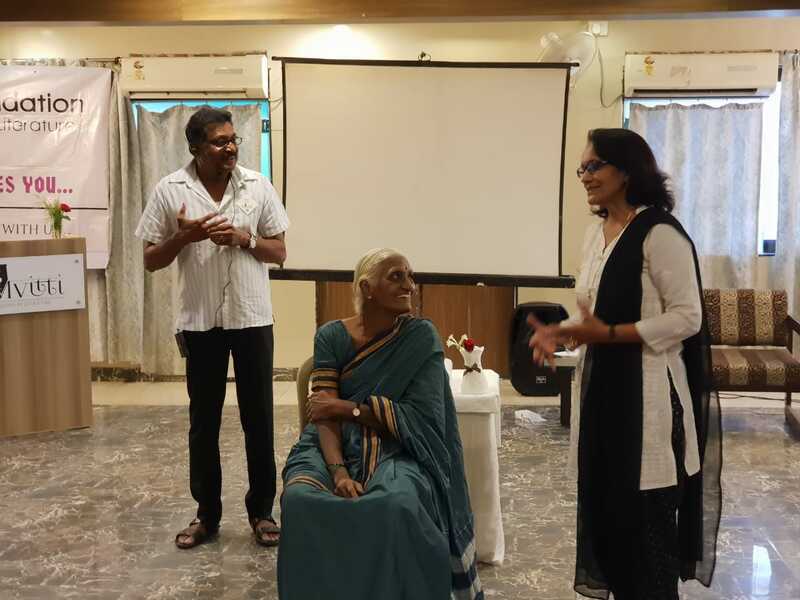 He then asked the participants to share some unknown proverbs and then made the participants think and share a few lines using those proverbs. The workshop was effectively compèred and moderated by Darshini Dadawala, First Trustee and Member of the Managing Committee of SaMvitti Foundation. 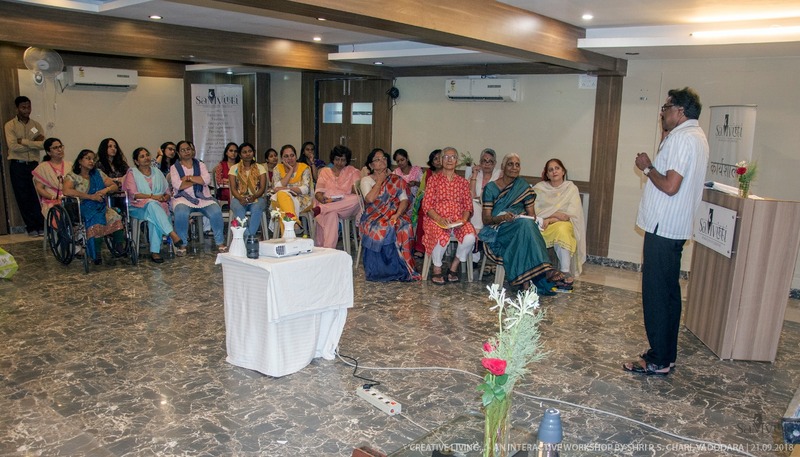 Dr. Dadawala created an environment for the workshop wherein she began with a question, “What is Creativity?” She explained that creativity starts with a thought and then to retain that thought and finally it needs to result into an expression of creative gesture. She cited some examples from literature in order to facilitate the understanding of the participants. Two award-winning animated films ‘Alike’ (La Fiesta Producciones Cinematográficas S.A.) and ‘La Luna’ (Disney Pixar) were shown during the workshop to communicate ideas effectively.